The Harryette M. Hodges and Kaneaster Hodges, Sr. Library, located in Samuel Moore Walton Hall, provides a welcoming environment as well as resources and services for students, faculty, staff and community members. The collection and services support coursework and research, along with providing recreational reading for users. Customers have access to reference materials, circulating books, periodicals, online databases and audiovisual materials. A wide range of electronic resources and services supplement these collections. 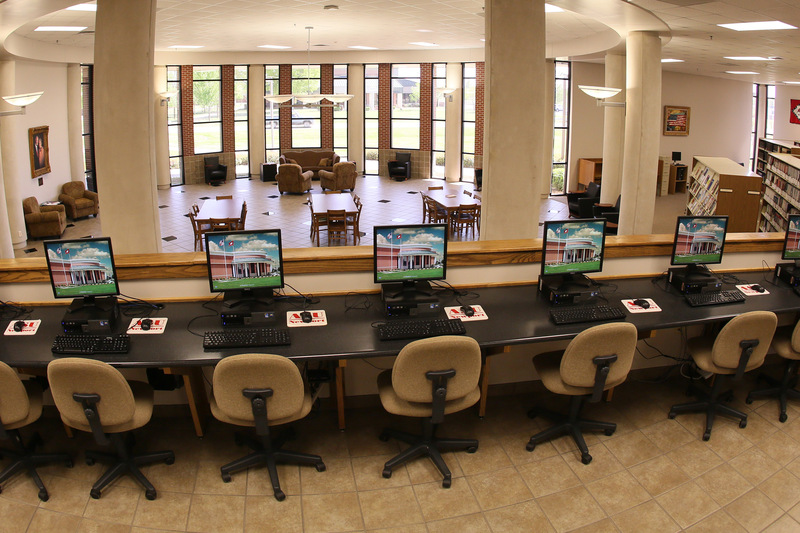 Additional resources include access to the Internet, the library catalog, user education and the Academic Support Center computer labs. Free tutoring services are available to ASUN students who need assistance. Click here for more details. In all instances, students and faculty of ASU-Newport have priority on the use of library materials and resources. In order to borrow materials, all borrowers will be required to present proper identification at the circulation desk. Community patrons may borrow materials after receipt of an ASUN Library Card. Books in the circulating collection can be checked out for a two-week period and then re-checked for two additional weeks. DVDs and videos, unless labeled “Library Use Only” or placed on reserve, can be checked out for one week. A student may borrow a maximum of five items, with no more than three being from the reserve collection. Equipment circulates to faculty and staff for instructional purposes. An exception to this policy is made for community and civic groups. Equipment will be lent to community and civic groups at the discretion of the librarian. Students must present their student identification card to borrow a laptop. Students may check out laptop computers for in-library use only. Students who check out the equipment are responsible for the equipment. Equipment may only be checked out by the person who will be financially responsible for it. Report theft of equipment to campus police and library staff immediately. We will not be responsible for any files or personal information stored on the laptop. Remember, this is state property, and everything stored on it is the property of the state. Students will be required to present a student identification card at the circulation desk in order to check out materials. Area residents checking out materials will be required to obtain an ASUN Library Card. Identification cards are made in the library. Please ask for assistance at the circulation desk. Patrons may make copies of items that cannot leave the library such as periodicals and reserve items as long as copyright laws are not violated. A 10¢ charge per page is assessed to partially offset the costs of copying. A patron must pay for any item checked out under his/her name that is lost or damaged beyond repair. The librarian will make the decision as to whether an item is damaged to the extent that it cannot be repaired. If a book requires rebinding due to patron negligence, the patron must bear the cost of the binding. If a patron does not return an item or if they have damaged an item beyond repair, the patron must pay for the item by remitting the purchase price of the item or paying a processing fee of $10 per item, whichever is greater. If the purchase price cannot be determined or if the item was a gift, a processing fee of $10 will be charged. Fines are not charged for overdue materials. When items become overdue, the patron will be sent two notices asking for return of the materials. After the second notification, a notice will be mailed to the patron, asking the patron to either return the items or pay for the items according to the terms stated in the circulation policy. The university will not release transcripts of any students who have not cleared fines or paid for lost or damaged library materials checked out under his/her name. If an item is checked out, customers can ask a staff member at the circulation desk to put a hold on the item. When the item becomes available, you will be notified, and it will be held for you at the circulation desk for one week. The Copyright Law of the United States (Title 17 U.S. Code) governs the making of photocopies or other reproductions of copyrighted material. Under certain conditions specified in the law, libraries and archives are authorized to furnish a photocopy or reproduction. One of these specified conditions is that the photocopy or reproduction is not to be “used for any purpose other than private study, scholarship or research”. If a user makes a request for, or later uses, a photocopy or reproduction for purposes in excess of "fair use," that user may be liable for copyright infringement. This institution reserves the right to refuse to accept a copying order if, in its judgment, fulfillment of the order would involve violation of the copyright law. Attempting to take any item from the library without properly checking the item out. Smoking or use of tobacco products. Verbal or physical abuse of other patrons or staff. Sexual misconduct, such as exposure, offensive touching or sexual harassment of other patrons or staff. Bringing in animals other than those authorized by the Office of Disability Services. Disruptive and unsafe behavior, such as loud talking, screaming, slamming doors, running, fighting or throwing things. Engaging in any activity prohibited by law or any conduct that unreasonably interferes with others’ use of the library. Failing to comply with reasonable staff requests. For their protection and safety, children under the age of 12 must be accompanied and monitored by parent or other responsible adult. Staff will ask patrons to leave the library. ASUN security will be called in to investigate the matter. Our Rittenhouse eBook Collection has titles that will help our Nursing and Surgical Technology students accomplish their goal of successfully completing their respective program. These eBooks are full-text and can be accessed via the portal. To access the Rittenhouse eBook Collection, users must be logged into the ASUN Portal and click on the library tab. Nursing Entrance Practice Tests, NET Test, TEAS Test, PSB Tests and more. Free online test prep for SAT, ACT, and GRE as well as a vocabulary builder. A world-wide provider of free, online practice exams. We exist to serve the education and testing markets and we’re proud to help you pass your upcoming exams. Free online test resource center for test preparation and new exams including ACT, SAT, GRE, GMAT and Praxis. A helpful took to enhance Math/Science/History skills. A helpful tool to enhance math skills. A helpful tool to enhance understanding of the COMPASS test. A collection of lessons, calculators and worksheets created to assist students and teachers of algebra.